Jack Lane gets a tackle in against Boston. Picture by Sally Ellis. 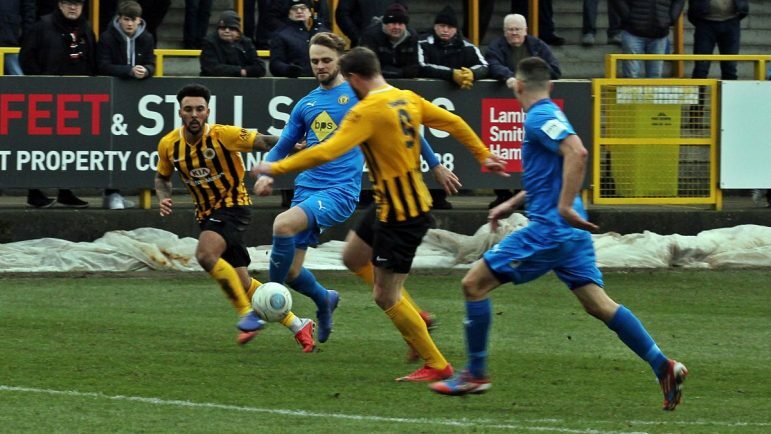 LEAMINGTON secured more vital points on the board and responded to a drubbing by Southport to clinch an away point against Boston United in National League North on Saturday. The visiting Brakes were far more adept defensively than they had appeared in their previous game, and will have been more pleased in securing a draw given the injuries to the likes of Connor Gudger, suspension of Jamie Hood and without Joe Clarke or Reece Flanagan available for Saturday’s away trip. After Leamington had escaped conceding in the opening couple of minutes, thanks to Junior English’s tackle to deny Gavin Allott an empty net to aim for from a corner, the Brakes went closer still with a corner of their own, finding the back of the net through Colby Bishop’s header on three minutes. Bishop’s 14th of the season was the perfect lift for Leamington, who would have anticipated a tough game right from the start against the hosts, but could do little to make up for losing Kieran Dunbar to injury not long after. The striker missed another headed chance not long after, whilst Ryan Qualter glanced wide for Boston. Bishop was evidently Leamington’s main hope in putting away and crafting chances, and he went close when turning two defenders and having a shot blocked, before Jordan Murphy sent the ball back into his path to fire just wide. A penalty awarded to the home side was hard to take, but there was no doubting the referee’s call as James Bowen lunged in on Max Wright with a late challenge, allowing Ben Davies to divert past Tony Breeden to level things up for the Pilgrims. Boston immediately looked a more threatening side than they had prior to the goal, and had Breeden forced into more action through Gavin Allott’s thumping header. In the second-half, it was a resuming of the threat that Boston had increasingly began to impose on the game, Jay Rollins being next to threaten when heading past the post, whilst a rare corner for the Brakes saw the side netting ripple from a headed chance. Breeden was left breathing a sigh of relief when Rollins had beaten the Leamington keeper but not the post, as the ball ricocheted off the woodwork and back into his gloves. Leamington were forced to hold firm as waves of attacks continued to face them, and it was thanks to alert defending from the likes of Jack Lane and Breeden’s reflexes to keep Boston out that they were able to consume time and claim a much-needed point in a tough fixture for the Brakes given the circumstances. Leamington host Stockport County in their next fixture, kicking-off at 7:45pm at the Phillips 66 Community Stadium on Tuesday night.